The APPSC Recruitment Board has released APPSC AEE Notification for Assistant Executive Engineer Vacancies. Candidates who are interested in APPSC AEE Jobs can utilize this opportunity by applying online for the APPSC AEE Recruitment Notification. The APPSC Recruitment Board is going to select the candidates depending upon their performance in the APPSC AEE Exam. So, to write the APPSC AEE exam candidates have to apply for the APPSC AEE Notification. Before applying online for AEE Notification 2018 AP candidates have to check the following eligibility Criteria for APPSC AEE Recruitment. Andhra Pradesh Public Service Commission Recruitment Notification 2018 released for the Andhra Pradesh Assistant Executive Engineer for 748 vacant posts. So, interested candidates can apply for these positions before the last Date. Applications are invited in Online Method. We have updated all the information regarding how to apply below in other sections to make this a hassle free process. The Andhra Pradesh Public Service Commission is soon going to start APPSC recruitment process for Asst Executive Engineer posts in the departments of Irrigation, Agriculture, Health and Panchayath Raj. There are about 748 AEE posts, which would be filled up by the commission in the respective departments. Andhra Pradesh Public Service Commission ( APPSC ): Here you are at the right place, candidates who are looking for the APPSC AAE Notification 2018. Due to formation of the Separate States of Andhra Pradesh & Telangana. Many Students have got good opportunity for their Recruitment in different departments of AP Govt. The Government of Andhra Pradesh has formed the APPSC – Andhra Pradesh Public Service Commission earlier and also it is continuing in the new state too. Now this APPSC has come up with the lot of APPSC Recruitment Notification 2018-2019 to give Bright Future for the interested aspirants. Here, is the APPSC AEE Vacancy list for APPSC AEE Jobs. Candidates who are looking for AEE Jobs opportunity can utilize this by preparing well for the APPSC AEE Exam. candidates have to apply online for the APPSC AEE Notification in order to participate in the APPSC AEE Recruitment Exam. The Above table tells you the detailed information about the vacancies for Asst Executive Engineer posts in the departments of Irrigation, Agriculture, Health. APPSC AEE Notification 2018 Free Job alert for both Fresher and Experienced Candidates updated on 14 Nov,2018. Get Direct Official Link for applying APPSC AEE Notification 2018 along with current APPSC AEE Notification official Notification 2018 here. Find all recent APPSC Vacancy 2018 across India and check all latest APPSC AEE 2018 job openings instantly here, Know upcoming APPSC AEE Notification 2018 immediately here. Candidates who get the required cutoff marks in the APPSC AEE Exam will get the APPSC AEE Jobs easily. So, we advise candidates to apply online for the APPSC AEE Notification before the last date and also prepare well for the APPSC AEE Exam by making proper timetable schedule. Aspirants who are interested in APPSC AEE Jobs are eagerly waiting for the AEE Notification 2018 in AP. Now can apply online for the APPSC AEE Notification through the APPSC Website. Here on this page, we have provided the APPSC AEE Official website links in order to quickly apply online for the APPSC AEE Notification. Also, Candidates can check eligibility conditions for APPSC AEE Notifications here on this page in the following sections. Also, Candidates have to prepare well for the APPSC AEE Exam by downloading the APPSC AEE Syllabus and APPSC AEE Exam Pattern for reference purpose. Aspirants can also check APPSC AEE Previous Year Question Papers here in a PDF format. Aspirants must need to apply for the APPSC AEE Notification before the last date. Do not wait for last minute submission. check the APPSC AEE Notification Eligibility Conditions in the following sections. The APPSC AEE Recruitment has following Age Limit Conditions. Minimum Age Limit For APPSC AEE Recruitment is 18 Years. Maximum Age Linit For APPSC AEE Jobs is 40 Years. Age relaxation of 3 years is provided for OBC and Ex-servicemen Candidates. Age relaxation of 5 years is provided for the SC/ ST Category and 10 years for PH Candidates. The Candidates who are applying for APPSC AEE Jobs must possess Graduation Degree in related fields from any Recognized University/ Institute. The APPSC Recruitment Board will select the candidates depending upon their performance in the following Exams. The Candidates who are selected for the APPSC AEE Jobs will get salaries between Rs. 37,100/- to Rs. 91,450/-. The APPSC AEE Notification Application fee according to category wise is as follows. 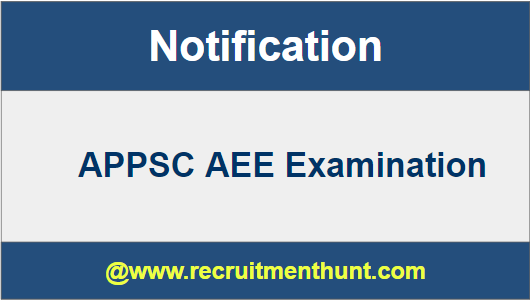 Search for APPSC AEE Notification 2018 link. Read the APPSC AEE Notification 2018 clearly. Now, apply for APPSC AEE Notification Recruitment online. Fill the APPSC AEE Notification Application form with correct details. Check the details and finally submit APPSC AEE Application form. Take a hard copy of APPSC AEE Application form for the future purpose. Finally, Candidates can download APPSC AEE Syllabus Previous Year Question Papers here. So, Applicants can make their preparation easier by following APPSC AEE Syllabus. Download APPSC AEE Patterns along with APPSC AEE Previous Year Question Paper on this article. Also, For more Job Updates stay Tuned to our site Recruitment Hunt.